But unless one has friends or family who've used a duct cleaning company, how does one choose? For me, it was based on two main factors: price and website. $49.99 sounds like a great price compared to other much higher specials. Along with the price, came "certified - licensed - insured" and offering other services such as power washing decks/siding and steam cleaning. Clean 4 Clean also had the most professional website. It showcased their products and services well, unlike other competitors whose sites were rather amateurish. As a bonus, Clean 4 Clean promotes that all their products are green and environmental friendly. So, I set an appointment for a Friday afternoon between 1- 4pm. Clean 4 Clean called the morning of the appointment to confirm and the tech called a bit later for permission to arrive earlier which turned out to be shortly after 12:30pm. Eventually, Andre - a polite, professional, young man looking to be in his early 20s - was hauling a blue 5-foot tall vacuum unit through my front door. The unit was nearly 6 feet tall. He positioned it below a vent in our family room, hooked a large flexible hose to it, taped the hose to the ceiling, and turned on the unit. The sucking had begun. Next, he brought in a small vacuum and opened the cover to the large return on the downstairs floor. Huge clumps of black dust, fur, and who-knows-what nearly blocked the smaller duct behind the vent grate. Andre's vacuum sucked that up and he used a large brush attachment on a drill to clean deeper into the duct work. Next, he cleaned the upstairs return duct which also contained a decent amount of black debris. Inspecting the central air unit, Andre had a mold testing tube which he described as a "CSI" approach to mold. Swabbing the interior of the unit near the drum, Andre then inserted the swab into a tube where the sample reacted with a liquid. A color chart on the tube's exterior showed a scale ranging from deep purple to light green. While the sample was black, Andre said that he's seen samples be darker and produce a green color on the indicator. Thus, no mold. However, my sample began producing a purple result after almost a minute. He claimed the test was for molds that would impact the respiratory system but didn't specifically know any mold names. Shortly after this, Andre worked up a customer order form. Here's where this process becomes a bit sketchy to me. Before this form, Andre mentioned that the special for $49.99 would become $170 based on my number of returns and mains and wanted to know if this would be acceptable. Kudos to him for being up front. I never expected to pay the special price and assumed a $200 bill would be more likely. However, I wasn't prepared for what Andre was about to show me. At the top of the form is a block labeled "AIR DUCT CLEANING" which listed the Special of 11 Vents, 1 Returns, 1 Mains: quantity of 1 for $50. Cleaning of Additional Openings: quantity of 1 for $20. Cleaning of Additional Mains: quantity of 2 for $100. There's the $170. The next block is labeled "FURNACE & A/C CLEANING" which the $49.99 special indicated that Clean 4 Clean would do a free inspection. Andre's inspection of the coils and blower determined that the central air unit needed cleaning. Furnace Cleaning: quantity of 1 for $75. Cooling Coil Cleaning: regularly $189.99 was now $150. Blower Motor Cleaning: quantity of 1, regularly $225 was now $175. This totaled $400. Now, remember that mold test? The next section is labeled "HIGHLY RECOMMENDED" with a line for Treat all Interior air passes with Sanitizer: EnviroCON (EPA Reg. #9804-3) Kills germs, micro bacteria, dustmite feces. The regular price for my townhouse treatment would be $225 but is now $180. Treat all Interior air passages with Sanitizer: Sporicidin (EPA Reg. #8383-3) 100% kill rate of disease causing mold. Normally $517 this is now $450. Treat all Interior air passages with Soot Sealant: Prevents particulate recontamination. Maintenance program for future cleaning included - no charge. $150. Total for this final block is $780. So, with 11 supply vents, 2 return vents, 3 main trunks, and 1 air handler with dirt, dust, dust mites, mold, pet hair, fungus, grease, carpet fiber, rust, and construction debris collected...my total bill is $1350. At the time Andre shows this to me, he had only completed the first block of $170 and strongly recommended the remaining two blocks. So, it wasn't like I was being hit with a bill for $1350. With Kim working for the government, we received a 10% discount bringing the total to $1150. But clearly sucking vents wasn't adding up to that price for me even with mold in the house. Andre phoned his boss and the price was brought to $950 based on our being willing to recommend Clean 4 Clean to others. We'd set aside some money for home repairs and this would wipe that out. But after discussing the price and work with Kim, we agreed to the $950. Andre was in our home for 3 hours doing all the tasks professionally and was fun to talk with. Before he left, Andre summoned me to the furnace where he had pulled the power to the unit to show me some circuitry that was sparking when the power was connected. After the quick demonstration, he recommended contacting someone to look at it as this was a fire hazard. When a friend examined the unit, he determined the emergency heat was coming on when the unit received power. It wasn't doing this prior to Andre's visit, but it became clear to me what may have happened. Andre cleaned the interior of the furnace and blower with power to the unit off. When he was done and turned the unit back on, he noticed the sparking. Either by accidentally or initially moving some wiring, Andre did the right thing to summon me and leave the unit off. But it's seems clear, a perfectly functional unit doesn't have sparking wires and emergency heat kicking in without some help. Andre mentioned the chemical smell from the fogging (the $450 treatment) would last for two hours and then smell like a fresh snowfall. After two days, the chemical smell which reminded me of new rain boots didn't come close to a crisp winter morning. Three weeks after the treatment, I do think the house smells clean and fresh. Our sinuses aren't being exposed to all that crud in the vents. But would I recommend Clean 4 Clean to someone else wanting to clean their vents? Yes and no. 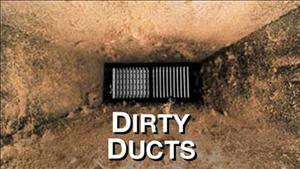 If one has a new home, duct cleaning would be completely unnecessary. It's possible that even an old home wouldn't need duct cleaning if no pets have been in the house. However, without knowing the full history of our townhouse (built in 1987) and it having six years of two cats and a dog living in its 1100 square feet...a duct cleaning was completely in order. I would totally recommend Clean 4 Clean as a service for cleaning your duct work if your home meets my criteria above. However, did I receive a good deal? Have you ever had your vents sucked? If so, how does your experience compare? Share your thoughts below. I have a HVAC and duct clecaning company in WV< We charge a flat fee of $325 a house and that includes using envirocon.Folks should be treated right. Thanks, Heatman. That sounds far more reasonable. Thanks for sharing!